Many of you will have seen the recent announcement for Photon Controller version 1.1. For me, the interesting part of this announcement is the support for vSAN as a storage platform with Photon Controller v1.1. I should think that the first question that those of you are familiar with both vSAN and Photon Controller will ask is “how do I configure vSAN for Photon Controller when there is no vCenter server in the mix?”. This is a very good question, and one which I will highlight in this blog post. There are also a few line items in the release notes which may not be very clear to those of you who are not very familiar with these products. I hope to be able to highlight these to you as well. Now since there is no vCenter, there are two appliances that need to be deployed in a Photon Controller environment to enable you to successfully deploy vSAN. The first of these is a vSAN Manager appliance and the second is a Lightwave server for authentication. We then use RVC, the Ruby vSphere Console, which is shipped in the vSAN manager appliance, to setup vSAN. Once installed, I configured this Lightwave server with a domain and password, as follows. The next step is to add a group and user which can be used for authentication when logging in to the vSAN manager appliance. These are the steps. Now comes the moment of truth. Can we successfully launch RVC, the Ruby vSphere Console, from the vSAN manager appliance and create a vSAN cluster? 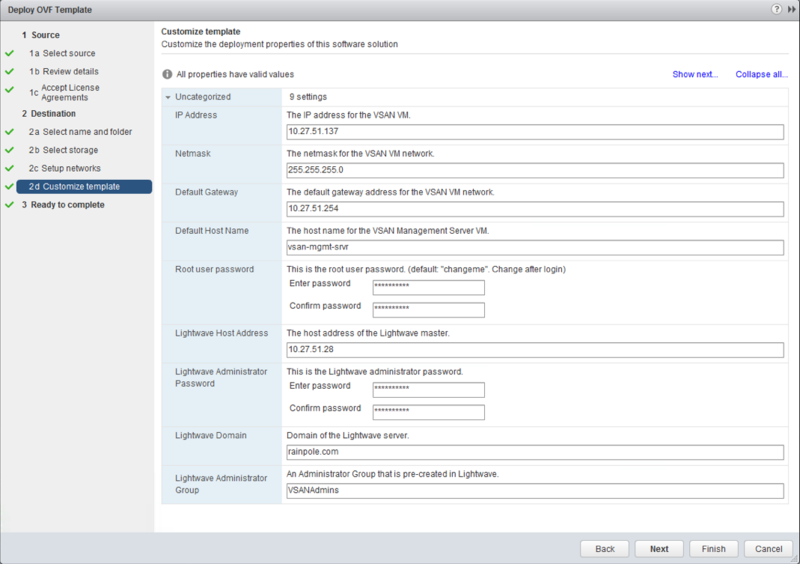 Login in to the vSAN manager appliance, and verify that you can connect the RVC using the VSANAdmin credentials we created earlier in Lightwave. Note the syntax is rvc@domain@vsan-appliance:port. If successful, we can begin to create vSAN. If not successful, you need to revisit the previous steps, ensuring that the user and group are created successfully, and that the vSAN manager has successfully joined the Lightwave domain. And we can also look at the cluster health. OK, so this health summary has highlighted a lot of issues with my vSAN cluster, especially with regards to driver and controller (you can scroll right to see more). I should address this before doing anything with this environment from a production perspective, but hopefully it gives you the idea. The one thing which is an issue at the moment, and which is called out in the release notes, is the fact that the performance service is not working properly in this release. To add clarity to some of the other statements in the release notes, notably the detection of the vSAN datastore 15 minutes after it has been created, or consuming it via the photon controller yml file, we did not want to put any restrictions on the user about when to install vSAN. So basically you can set this up in two ways. The first is to install Photon Controller first, then vSAN or install vSAN first, then Photon Controller. If a vSAN datastore is created after Photon Controller is installed, Photon Controller detects that vSAN datastore after 15 minutes. This means that if you installed Photon Controller first, then created a cluster, Photon Controller will detect it but 15 minutes later. This datastore can then be used for the provisioning of VMs (for clustering frameworks like Kubernetes). If you are planning to use a vSAN datastore as the image datastore however, but you plan to install vSAN after Photon Controller, you must make sure that you add vsanDatastore in the deployment yml. There is a known issue, which will be addressed in a future release, where we can’t easily use the vsanDatastore if we don’t know about it at deployment time. I’m going to leave this here for now, but I will follow-up shortly with a post on how we can deploy Kubernetes onto this configuration using photon controller CLI, placing the Kubernetes VMs (master, etcd, workers) on the vSAN datastore. Great article, I have really enjoyed your article. You show how to deploy Photon Controller v1.1 with vSAN . It is really helpful. I have done by the help of your article. Thanks for sharing. The way you explained each and everything is really great. Thanks once again for sharing. It’s a nice post which is just what I’m looking for. I deployed a VSAN Manager Appliance on a standalone ESXi using ovftool, but the host name and root password of the VM are always disregarded, and the VSAN Manager appliance is not listed in dir-cli nodes list. Any advices? I’m afraid not. Check the issues section on Github to see if anyone has encountered it before. Otherwise raise it as a new issue if you can’t find a solution.